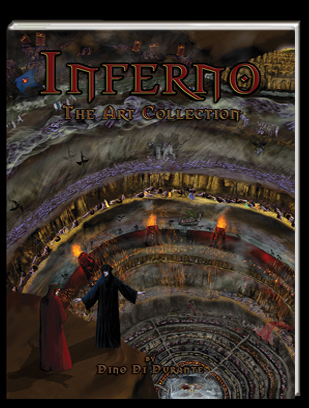 "Inferno - The Art Collection" by Dino Di Durante is a book depicting a 72-piece art collection based on Dante's Inferno, the first part of The Divine Comedy. This collection took over 7 years to complete and it is now printed in full color on 8.5"x11" books in several languages. The Divine Comedy has been visually interpreted by countless artists in the last seven centuries, however, few have stood out. First came Sandro Botticelli, then Gustave Dore, Francesco Scaramuzza, Amos Nattini, and also the great Salvador Dali. Now, a contemporary artist, Dino di Durante, has taken the challenge again. Di Durante is a concept artist himself, who took on the hard task of bringing to life Dante's Inferno on canvas as well as on film and other mediums. The details, rich colors and accurate representation where accomplished with the help of Lucia Checchi, Avetik Balain and Dantologist Riccardo Pratesi. Durante's profound interpretation of Hell surpasses that of all others who have attempted to understand what Dante Alighieri put into words seven centuries ago. Dino Di Durante, has put his heart and soul into the amazing venture to bring Dante Alighieri's Divine Comedy masterpiece to life in all possible forms. This is just one of them among the many already finished or works-in-progress projects. This entire collection now available as a book of illustrations at Amazon.com and expanding to other outlets worldwide. Most paintings in this collection have been animated into independent clips that put together made possible the films Dante's Hell Animated (English version) and Inferno Dantesco Animato (Italian version). These films are available on DVD format.